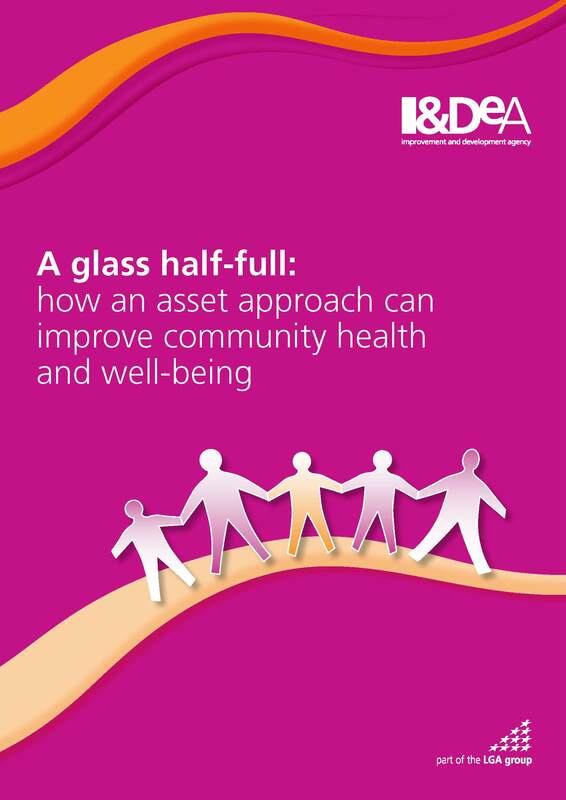 The widely read 'A glass half-full' written by Jane Foot with Trevor Hopkins makes the case for using an asset based approach in work to improve health and well-being and challenge health inequalities. 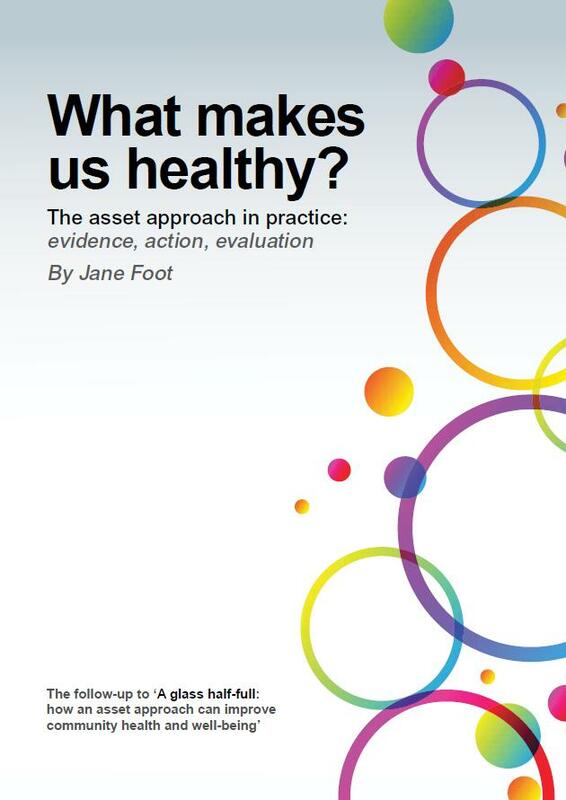 'What makes us healthy', a new publication written by Jane Foot, has the latest thinking on the evidence, action and evaluation of the assets approach. Both publications contain a number of case-studies from across the country. Many of the publications featured here are recommended by Asset Based Consulting as essential reading if you are interested in taking an asset based approach. Some have been influenced by the ideas in 'A glass half-full' or reference it in their bibliography. Others have influenced our thinking. They all have one thing in common; they all argue that we need to take a radically different approach if we are to improve health and well-being and address the health inequalities in and between many of our communities. Click on download and the publication will open in your browser. You can then read, save or print it out. The publications will all open as 'Adobe Acrobat' files. You can download the latest version of Acrobat Reader from the Adobe website for free. The follow-up to the popular 'A glass half-full'. ‘What makes us healthy?’ has information on the evidence for the beneficial effects of assets such as social relationships and networks on health and wellbeing; ideas about how to put asset principles into practice; and help with assessing whether the new ways of working are having an impact. This publication will inspire and support those who want to look again at what they are doing to improve health and wellbeing and to tackle health inequalities. 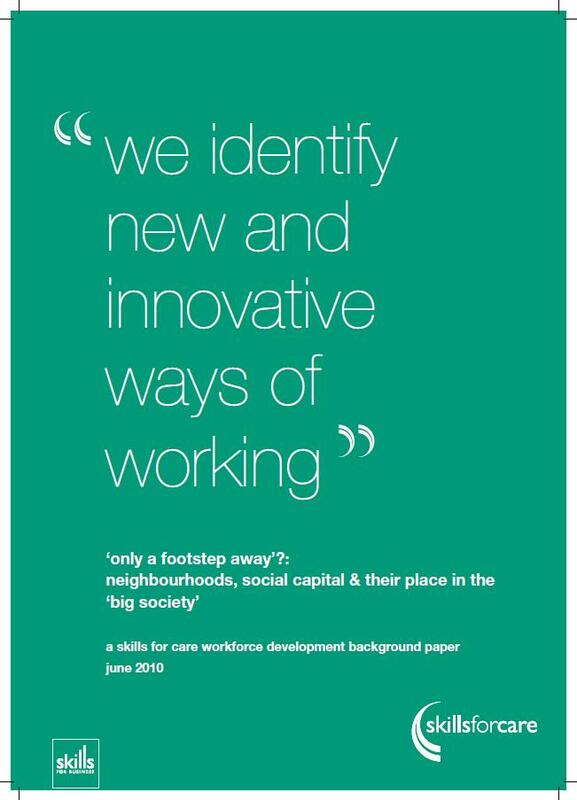 Asset based working is not an alternative to properly funded public services. 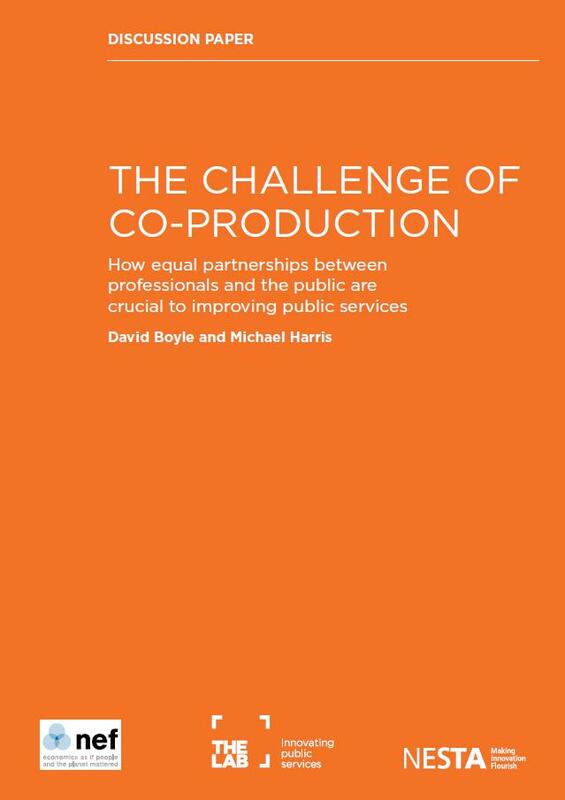 It challenges how those services are designed and delivered and requires a recasting of the relationship between commissioners, providers, service users and communities. It puts a positive value on social relationships and networks, on self confidence and efficacy and the ability to take control of your life circumstances. It highlights the impact of such assets on people’s wellbeing and resilience and thus on their capacity to cope with adversity including poor health and illness. These are things that need nurturing and supporting more than ever. The 'Asset Approach' values the capacity, skills, knowledge, resources and potential in an individual, family or community. In an asset approach, the glass is half-full rather than half-empty. 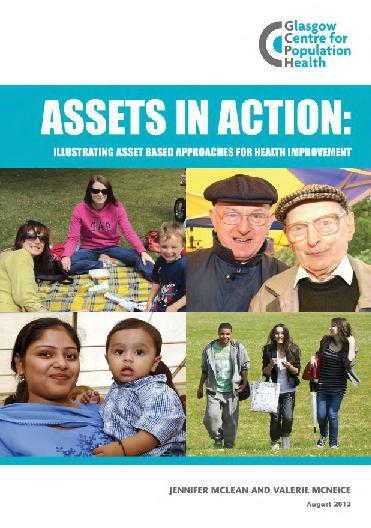 Published by The Health Foundation in April 2015, 'Head, hands and heart: asset-based approaches in health care' has been researched and written by Trevor Hopkins and Simon Rippon and is a review of the evidence and case studies of asset-based approaches. Produced by a partnership working group from NHS Wakefield District, Wakefield Metropolitan District Council, Eastmoor Community Project and five community groups within the Knottingley area. With additional support and direction from Kate Faulkes (Regional Empowerment and Cohesion Manager) and Denise Buttrell (Freon). 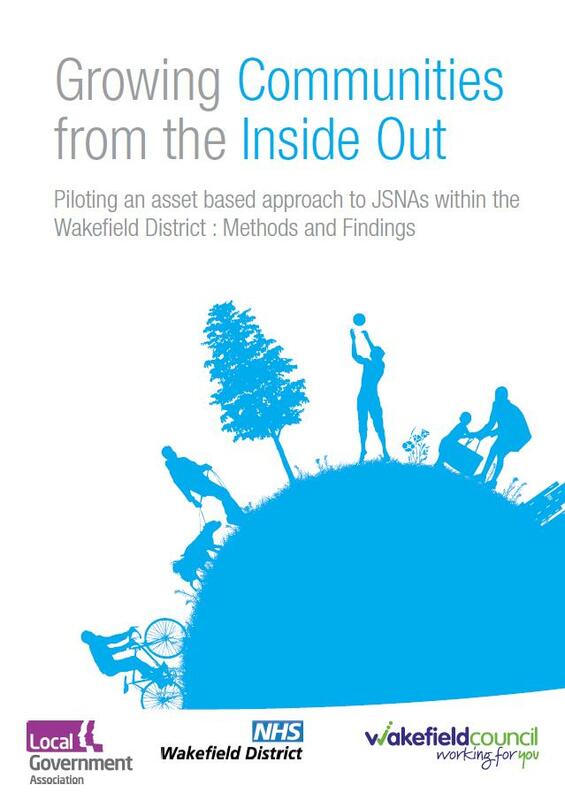 This report was written by Jane Greetham, Health Development Manager, NHS Wakefield District with contributions from Dominic Charkin, Community Development Worker, Eastmoor Community Project Ltd, Helen Laird, Wakefield Joint Public Health Unit and Denise Butterell, Freon. 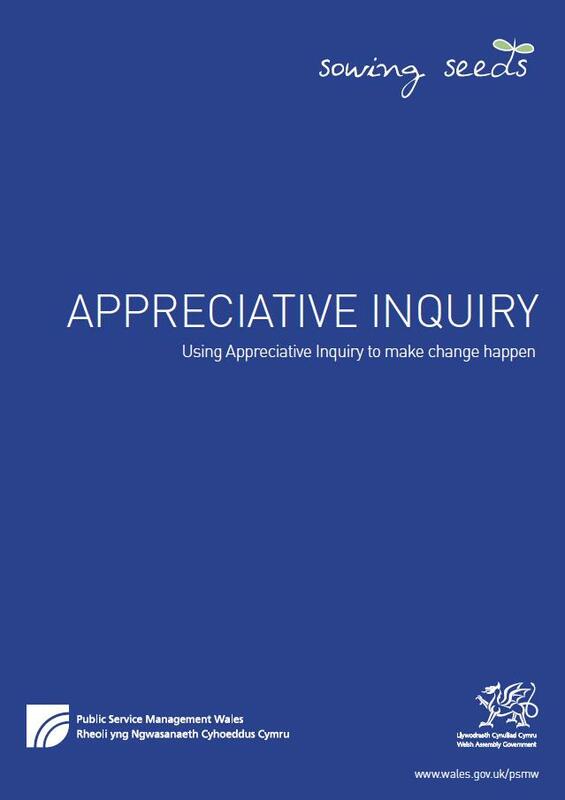 Using Appreciative Inquiry to Make change happen. 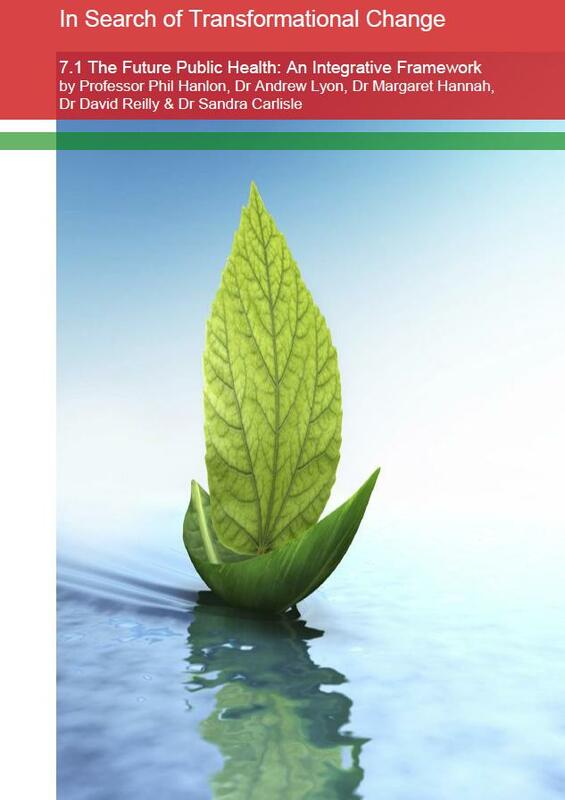 This publication is one of the series of Sowing Seeds topic papers published by Public Service Management Wales. 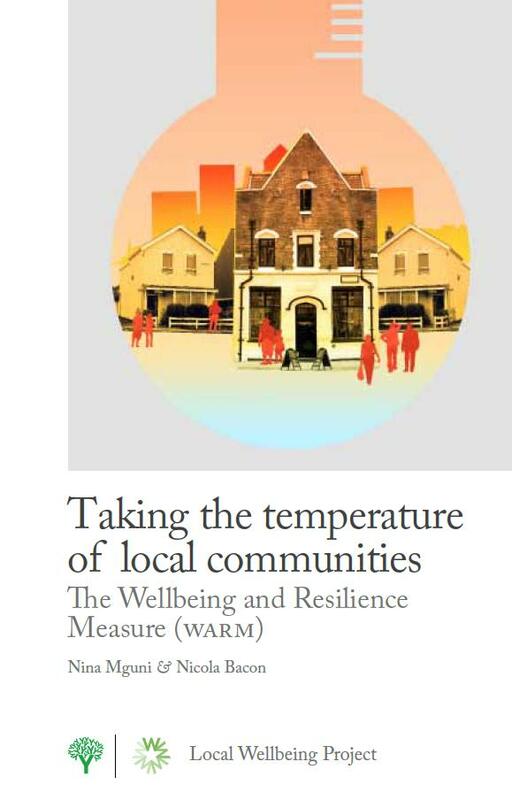 This report presents a new tool to measure wellbeing and resilience (WARM). The report sets out the conditions which contribute to wellbeing, from level of life satisfaction, the quality of the social networks to the wider local infrastructure. WARM arranges this data to construct a story about how a community is faring. It shifts focus away from looking solely at a communities deficits, such as poor health and social isolation, and sharpens the focus on community assets. This is central to understanding the capacity of a community to help itself. We argue that WARM measures what matters at a local level. Written for the website 'The Influence of Culture on Mental Health and Wellbeing', based in the Public Health Section of the University of Glasgow and funded by the Mental Health Division of the Scottish Government. Across different fields, from regeneration and community development to health, a new language of ‘assets’ is helping practitioners find new ways of tackling old issues. 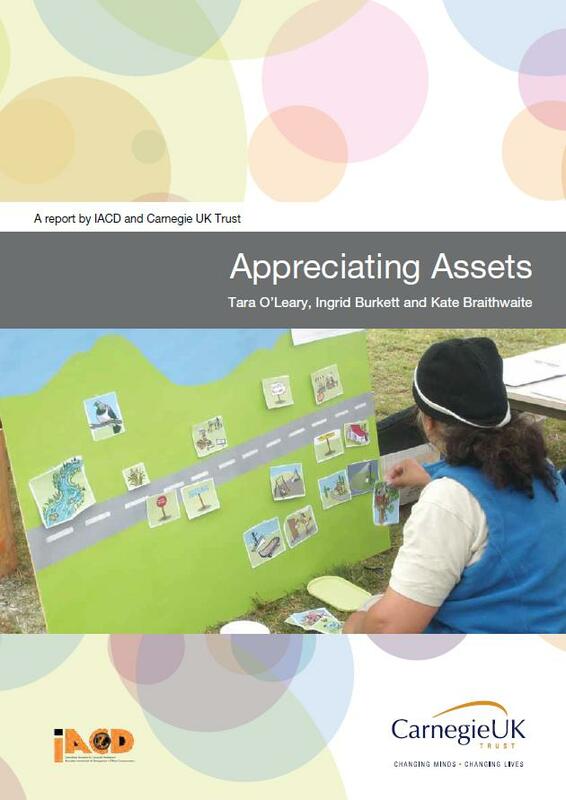 This report is intended to complement all this work by showcasing international, UK and Irish experience of ‘appreciating assets’. Practice in the UK and Ireland can stand tall alongside international examples. Throughout, we share questions that practitioners across many contexts seem to be grappling with. Our intention is that these questions can offer readers pause for reflection around key points that contributors to this report have identified as being important. 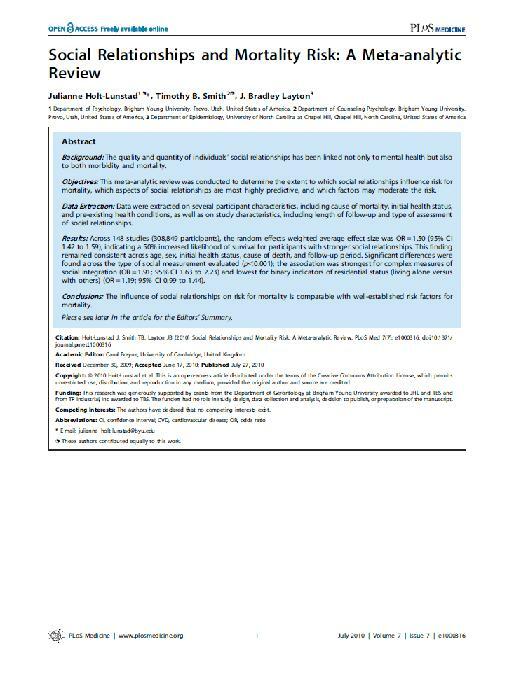 Published by The Health Foundation in April 2015, 'Head, hands and heart: asset-based approaches in health care' has been researched and written by Trevor Hopkins and Simon Rippon and is a review of the conceptual evidence and case studies of asset-based approaches in improving health, care and wellbeing services and outcomes. 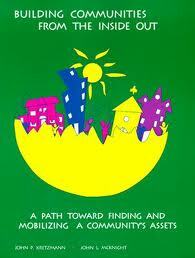 An assessment of how faith communities contribute to building social capital. The Government has identified faith communities as important sources of ‘social capital’ in community development and regeneration. But religion is also associated with conflict and division. How far is this faith in ‘faith’ justified? And how far should faith communities comply? 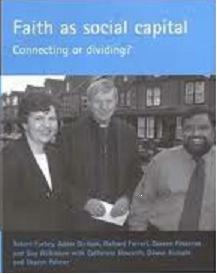 Faith as social capital assesses the debate and the evidence. The research in the report encompasses five major faith traditions (Christian, Hindu, Jewish, Muslim and Sikh) across four English regions. It explores the nature of social capital stemming from faith buildings, associations, engagement with governance and participation in the wider public domain. 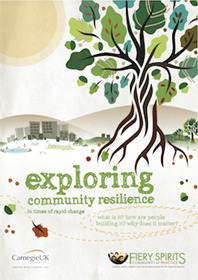 Gathers a mix of experience and academic insight into how local communities are learning how to cope – and even thrive - through difficult times. Written in an accessible style its stories highlight experience from Cumbria to the Scottish Highlands, and from New Orleans to Tooting, London. Web links direct readers to topical references, and a practical guide shows how to run a community workshop on the topic. 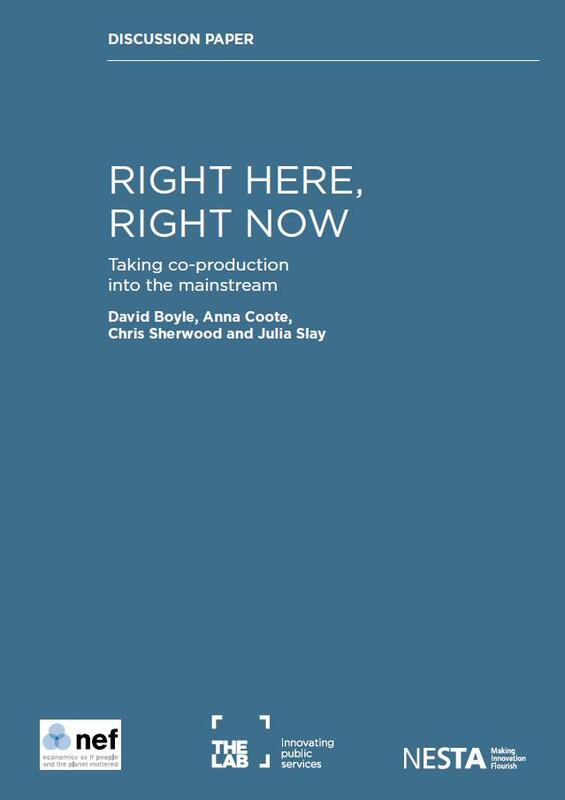 The book was produced by a network of community activists, professionals and policy makers which is supported by Carnegie UK Trust (www.fieryspirits.com). The network is run by its members to enable learning on topics relevant to building more resilient, vibrant communities. 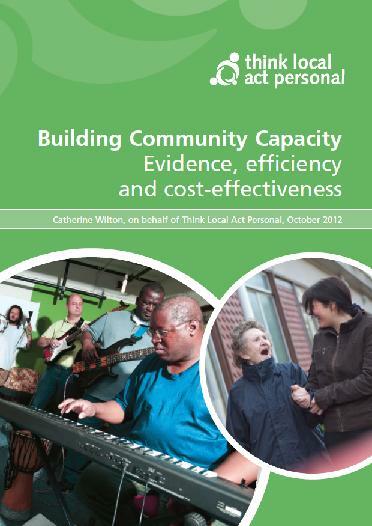 This new paper briefly draws together some of the evidence that 'Think Local Act Personal' is aware of that contributes to demonstrating better outcomes, or in some cases, the financial benefits of nurturing stronger communities. 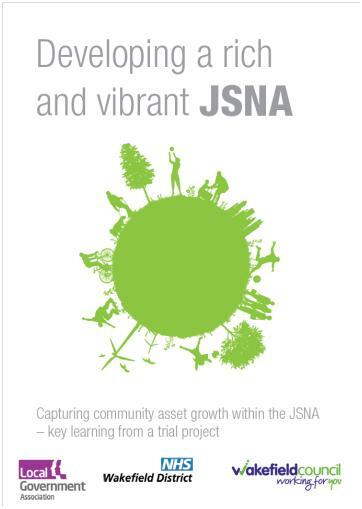 There are some fundamental lessons to learn about the health-preserving effects of good social networks, connected communities, the value of peer support and the multiplicity of outcomes well beyond social care that can be improved by working with local people in a co-productive way. 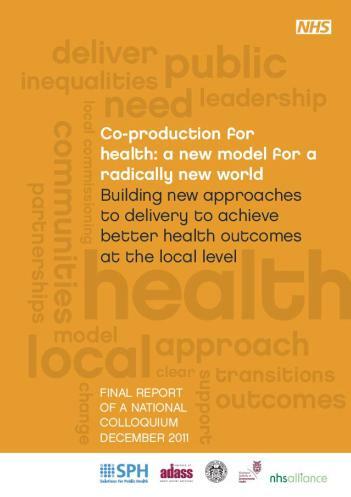 There is a strong case to be made for a joined-up, local approach to health and wellbeing that seeks to connect people together and to create the conditions for happier, healthier communities through participation and inclusion. 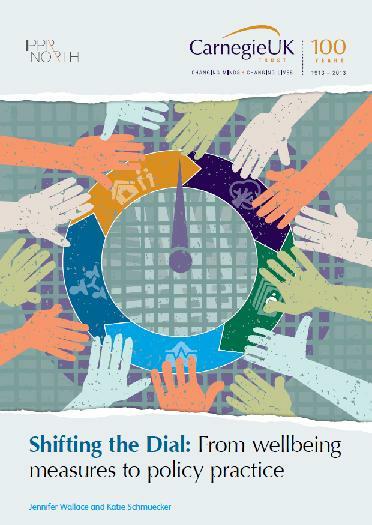 The report provides evidence from six case studies of experiences of measuring wellbeing in France, the USA and Canada and concludes that wellbeing measures are at their most effective when they are supported by a combination of strong leadership, technocractic policy processes and building momentum through wide buy-in from civil society, citizens and the media. Where these elements come together, we have seen benefits for individual and community wellbeing by identifying policy gaps and innovative ways of working. 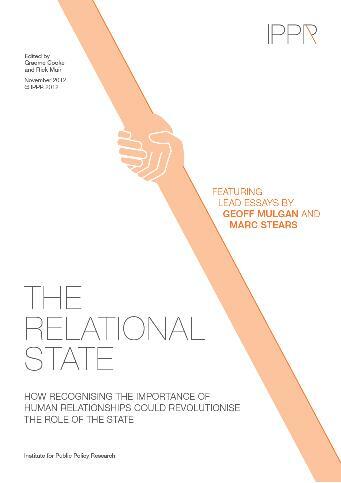 The purpose of this collection of essays is to introduce and discuss the idea of the ‘relational state’ – a new intellectual and political perspective on statecraft and the public services. A new model for a radically new world. Building new approaches to deliver to achieve better health outcomes at the local level. 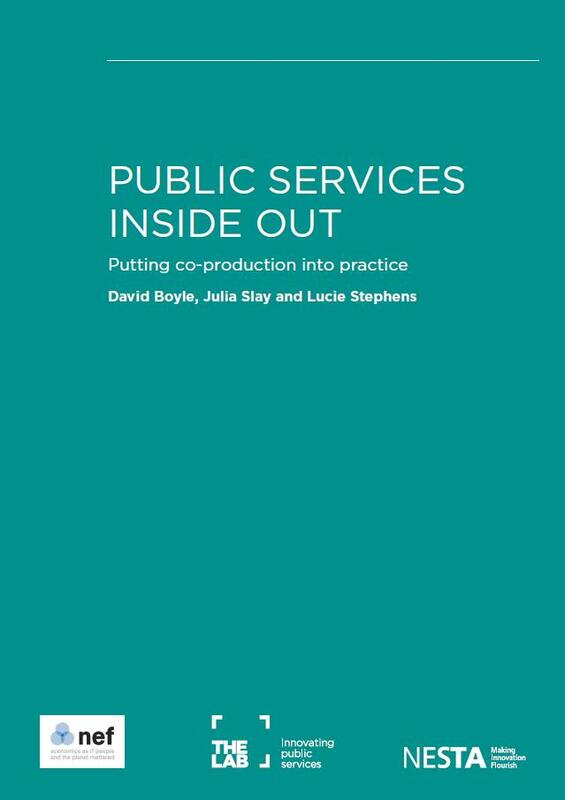 The necessary components of a new co-production model for public health. This year’s Annual Report takes an approach that recognises the assets available to support adults of working age to have good health. This is a different, positive way of thinking about health and wellbeing which reminds us to look at ‘what is/can keep people well’ and not just those things that ‘make us sick. Does income inequality cause health and social problems? 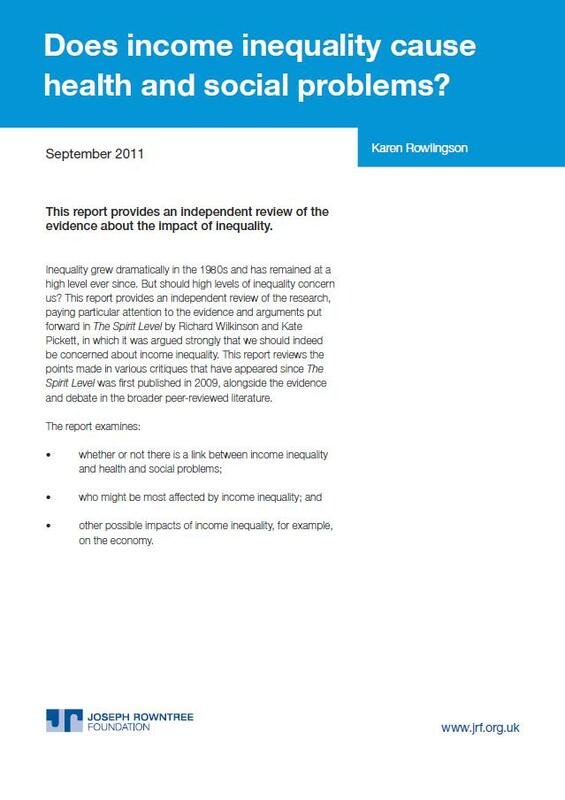 A Joseph Rowntree Foundation report that provides an independent review of the evidence about the impact of inequality. 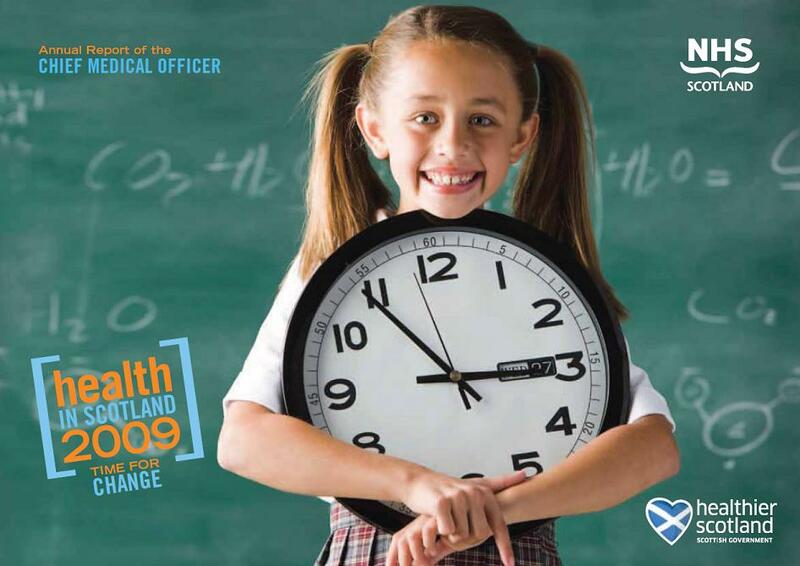 In his most recent annual report, ‘Health in Scotland 2009: Time for Change’ (Scottish Government, 2010) Dr Harry Burns, the Chief Medical Officer for Scotland asks whether ‘it is time to consider a change’ in the methods we currently use to improve health and to move to more upstream asset based approaches to improve health outcomes. He proposes that asset based approaches may provide the necessary step change in health creation which Scotland needs to accelerate gains in healthy life expectancy across the population. 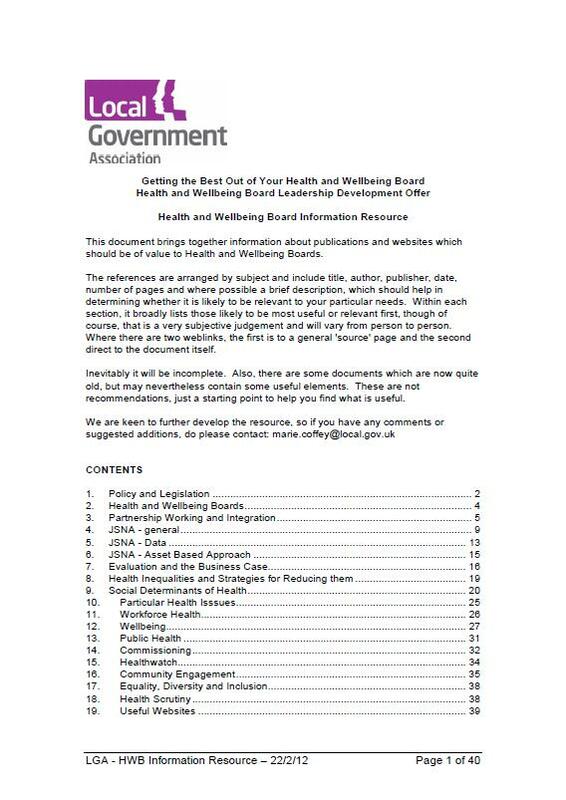 This well researched document from the LGA (March 2012) brings together information about publications and websites which should be of value to Health and Wellbeing Boards and includes information on 'Asset Approaches'. The references are arranged by subject and include title, author, publisher, date and where possible a brief description, which should help in determining whether it is likely to be relevant to your particular needs. Within each section, it broadly lists those likely to be most useful or relevant first. Inevitably it will be incomplete. Also, there are some documents which are now quite old, but may nevertheless contain some useful elements. These are not recommendations, just a starting point to help you find what is useful. 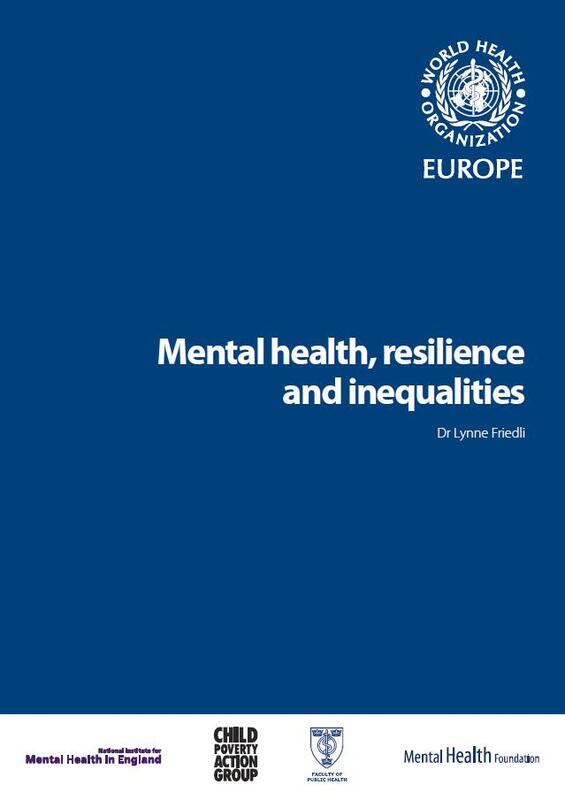 This report explores the wealth of evidence that mental health influences a very wide range of outcomes for individuals and communities. These include healthier lifestyles; better physical health; improved recovery from illness; fewer limitations in daily living; higher educational attainment; greater productivity, employment and earnings; better relationships with adults and with children; more social cohesion and engagement and improved quality of life. People-Centred Public Health examines how members of the public can be involved in delivering health improvement, primarily as volunteers or lay health workers. With a foreword by Professor Sir Michael Marmot and Dr Mike Grady, this timely book draws on a major study of lay engagement in public health, using case studies and real life examples to provide a comprehensive and accessible overview of policy, practice and research in this area. 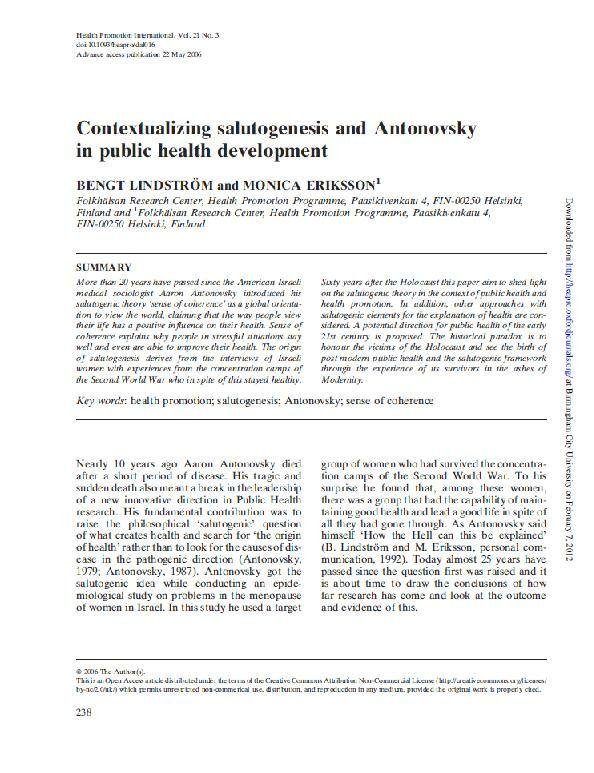 In an economic and political climate where there is renewed interest in the role of the citizen, the authors challenge old orthodoxies in public health and build a coherent argument for radical change in the way public agencies support lay action. Building on the lessons of early labor leaders, civil rights volunteers, and political activists, Jim Diers has developed his own models and successful strategies for community development. 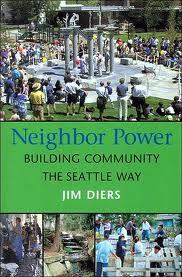 "Neighbor Power" chronicles his involvement with Seattle's communities. This book not only gives hope that participatory democracy is possible, but it offers practical applications and invaluable lessons for ordinary, caring citizens who want to make a difference. 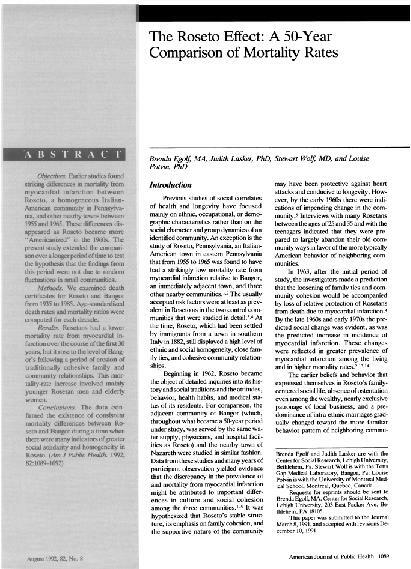 "Asset based approaches offer one means of addressing the social determinants of health by recognising that traditional epidemiological risk factors approaches to health development such as programmes on smoking cessation, healthy eating and physical activity are insufficient on their own to ensure the health and wellbeing of populations. In particular, many of the solutions to addressing the social determinants of health rely on the ability to recognise... that individuals, communities and populations have significant potential to be a 'health resource' rather than just a consumer of health care services." This guide to what the authors call "asset-based community development" summarises lessons learned by studying successful community-building initiatives in hundreds of neighbourhoods across the United States. It outlines in simple, "neighbourhood-friendly" terms what local communities can do to start their own journeys down the path of asset-based development. This guide will be helpful to local community leaders, leaders of local associations and institutions, government officials, and leaders in the philanthropic and business communities who wish to support effective community-building strategies. The most startling thing about disasters in not merely that so many people rise to the occasion, but that they do so with joy. 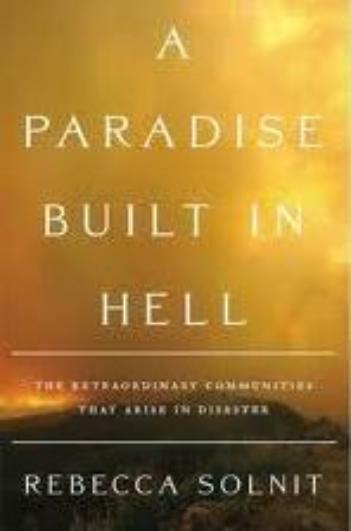 A Paradise Built in Hell is an investigation of the moments of altruism, resourcefulness and generosity that rise amid disaster's grief and disruption. It considers their implications for every day life. It points to a new vision of what society could become - one that is less authoritarian and fearful, more collaborative and local. 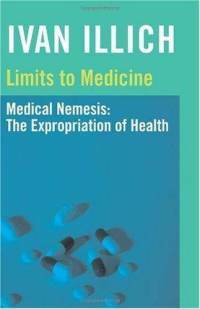 “By denying public recognition to entities that cannot be measured by science, the call for pure, orthodox, confirmed medical practice shields this practice from all political evaluation.” Ivan Illich. Illich's deeply shocking analysis into the clinical and social reality of 'doctor-made' illness was written in 1976 but still has relevance in critiquing the 'reductionist' and medicalised model of health that still predominates today. "Only by recognising and insisting upon the essential ingredients of personal health, Illich argues, can individuals recover the integrity of their bodies and lives." 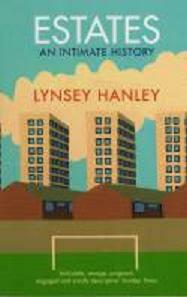 Lynsey Hanley was raised just outside Birmingham on one of the largest council estates in Europe. Writing with passion, humour and a sense of history, she tells the story of estates in Britain through the prism of her own experience. She challenges the stereotypes that estates have in Britain and asks why the homes that were built to improve people's lives ended up, in many cases, doing the opposite. 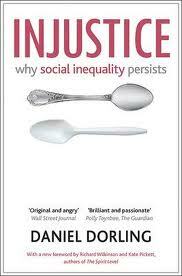 This groundbreaking book, based on thirty years' research, demonstrates that more unequal societies are bad for almost everyone within them - the well-off as well as the poor. The remarkable data the book lays out and the measures it uses are like a spirit level which we can hold up to compare the conditions of different societies. Almost every social and environmental problem - ill-health, lack of community life, violence, drugs, obesity, mental illness, long working hours, big prison populations - is more likely to occur in less equal societies. Incisively written, this new edition of the popular guide first published in 1996 slices through the rhetoric of health promotion. Its penetrating analysis quickly reveals health promotion's conceptual roots, providing an enlightening map of their web of theory and practice. David Seedhouse proves that health promotion, a discipline intended to improve the health of a population, is prejudiced - every plan and every project stems first from human values - and argues that only by acknowledging this will a mature discipline emerge. 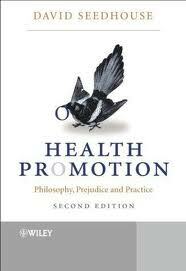 The author proposes a positive, practical theory of health promotion destined to inspire anyone who wishes to create better health. Few would dispute that we live in an unequal and unjust world, but what causes this inequality to persist? 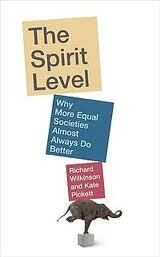 Leading social commentator and academic Danny Dorling claims in this timely book that, as the five social evils identified by Beveridge are gradually being eradicated, they are being replaced by five new tenets of injustice, viz: elitism is efficient; exclusion is necessary; prejudice is natural; greed is good; and despair is inevitable. The Roseto effect: a 50-year comparison of mortality rates. People are nourished by other people. The importance of social networks in health and longevity has been confirmed again by study of a close-knit Italian-American community in Roseto, Pennsylvania. Roseto seems a diorama of what once was the nation's ideal lifestyle-neighbors who looked after one another, civic-minded joiners and doers who formed the grass roots of American-style democracy. Thirty years earlier, medical researchers were drawn to Roseto by a bewildering statistic: in defiance of medical logic, Rosetans seemed nearly immune to one of the most common causes of death. They died of heart attacks at a rate only half of the rest of America. Doctors were mystified in that residents led what medical textbooks predicted would be short lives.The men of the village smoked and drank wine freely. They spent their days in backbreaking, hazardous labour, working 200 feet down in nearby slate quarries. At home, the dinner tables each evening were laden with traditional Italian food, modified for local ingredients in ways that would drive a dietitian to despair. The Mediterranean diet, with its use of olive oil rather than animal fat, has been touted for health benefits. But, poor immigrants couldn't afford to import cooking oil from their homeland and instead fry their sausages and brown their meatballs in lard. Yet, the resulting hefty bodies contained unusually health hearts. Why? The quality and quantity of individuals’ social relationships has been linked not only to mental health but also to both morbidity and mortality. This meta-analytic review was conducted to determine the extent to which social relationships influence risk for mortality, which aspects of social relationships are most highly predictive, and which factors may moderate the risk. Data were extracted on several participant characteristics, including cause of mortality, initial health status, and pre-existing health conditions, as well as on study characteristics, including length of follow-up and type of assessment of social relationships. The report concludes that the influence of social relationships on risk for mortality is comparable with well-established risk factors for mortality. 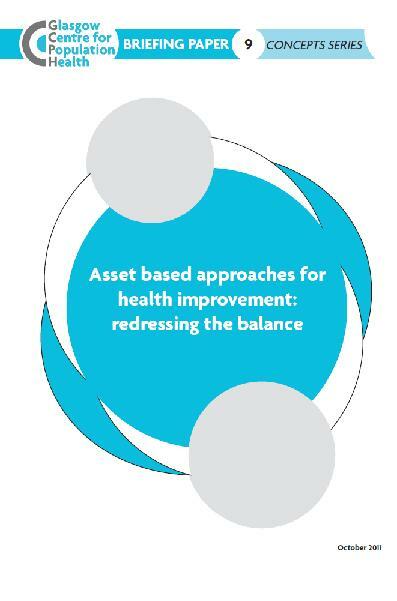 This Concepts Series briefing paper from the Glasgow Centre for Public Health is the second to focus on asset based approaches. 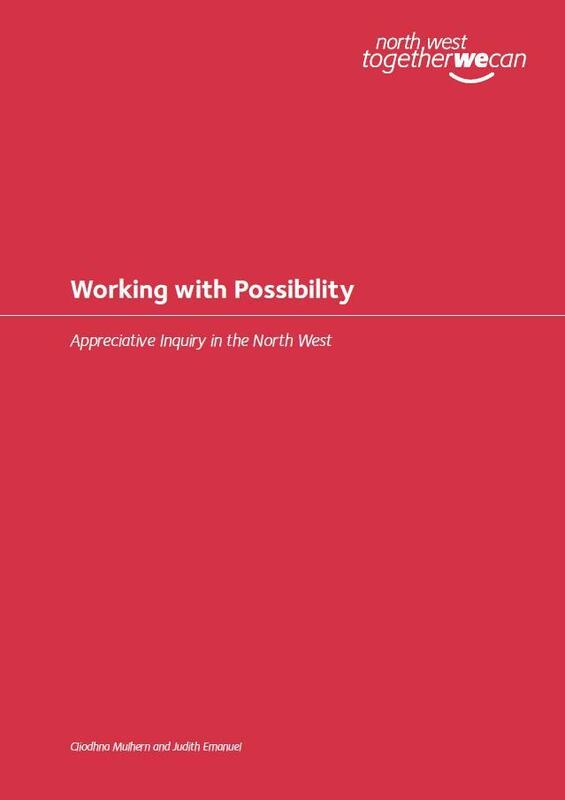 The aim of this paper is to present and discuss a range of methods and techniques which can be used to mobilise individual and community level assets. 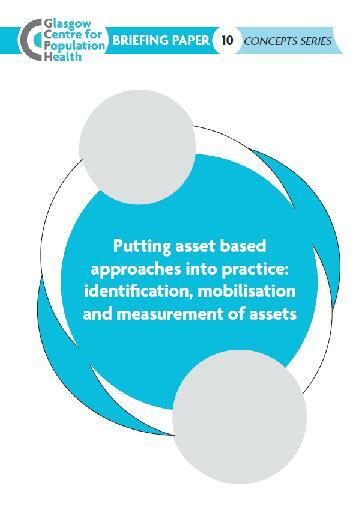 It is hoped that this briefing paper will provide further context and support to policy makers, practitioners and researchers and contribute to the growing evidence base on asset based approaches. 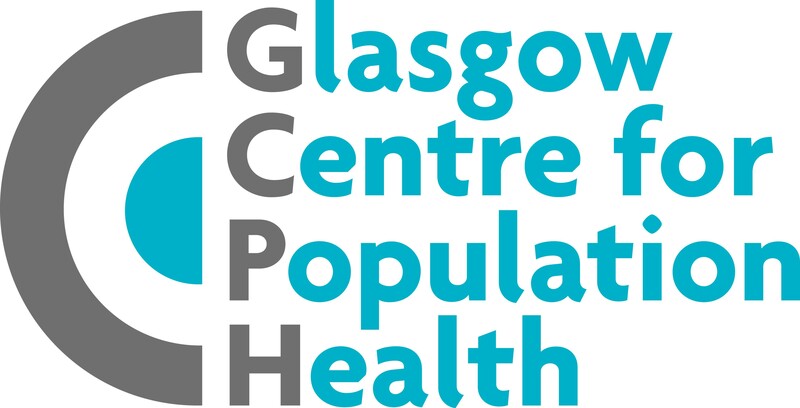 The aim of this briefing paper from the Glasgow Centre for Population Health is to present the current evidence and thinking on asset based approaches for health improvement, the background and rationale for these approaches, and the practical challenges of adopting these approaches in reality. 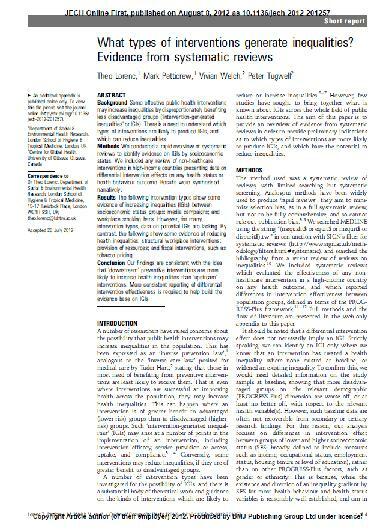 It is also hoped that this paper will help stimulate policy makers, practitioners and researchers to think differently about how they might minimise the risks of widening health inequalities and approach the goal of improving the health of communities and populations. What types of interventions generate health inequalities? Some effective public health interventions may increase inequalities by disproportionately benefiting less disadvantaged groups (‘intervention-generated inequalities’ or IGIs). There is a need to understand which types of interventions are likely to produce IGIs, and which can reduce inequalities. The overarching critique represented by the medical humanities is that the powerful gravitational pull and success of medicine over the past century has led health to be viewed almost entirely from the perspective of medical science. Therefore health research, policy and practice tends to be informed by the methods, protocols and training approaches of biomedicine ignoring wider sources of understanding of what makes human lives go well. Professor Phil Hanlon from the University of Glasgow discusses the loss of wellbeing and inequalities as emergent products of our late modern culture and social structures. He argues that these problems will not improve until there is a radical transformation of our whole society and the culture that has created it. 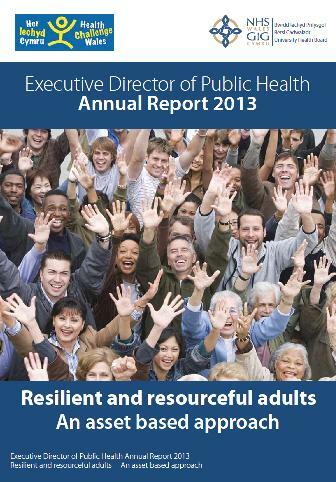 This year’s NHS Wales Executive DPH's Annual Report takes an approach that recognises the assets available to support adults of working age to have good health. This is a different, positive way of thinking about health and wellbeing which reminds us to look at ‘what is/can keep people well’ and not just those things that ‘make us sick. Lynne Friedli - Understanding Poverty - a presentation from the Community Assets & Poverty seminar, which was jointly organised by SCDC and the Poverty Alliance in May 2012. It asked: How do we achieve a balance between supporting communities to release their potential, use the assets they have at their disposal, and retain a focus on the root structural causes of problems that many communities and individuals face?